Blind people empowering blind people to be employed, independent and free. 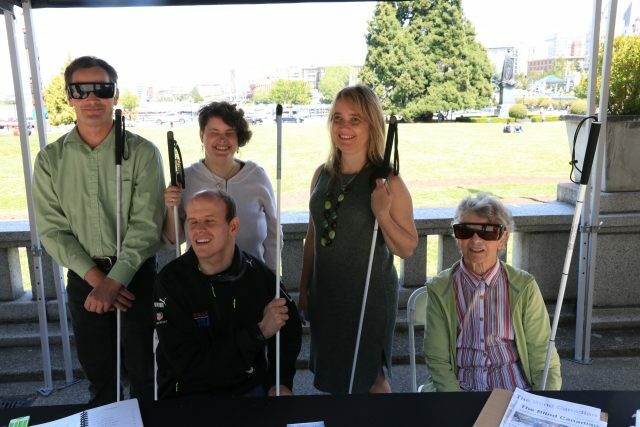 The Pacific Training Centre for the Blind (PTCB) serves low vision, blind and deaf-blind adults in Greater Victoria and those who come from other parts of BC of all ages, from young adults to seniors. The PTCB provides all its services and training free of charge to blind people. The Blind People in Charge program is the only service of its kind in Western Canada that offers a regular, multi-month intensive rehabilitation program to adults who are blind or who are losing their vision; it is also the only program that uses an empowering, problem-solving model of instruction, where blind people are the teachers, planners, directors and administrators. Blind instructors and mentors teach non-visual independence, mobility, literacy and life skills, such as Braille, adaptive technology, cane travel, cooking, cleaning, organizational skills, home and financial management, job readiness and other important skills, and develop positive strategies for living without sight; they provide this training one-on-one and in group settings.